Another ex-library book about a cat that made its way into my collection. There isn't a lot of information available about this book. There don't seem to be many second-hand copies available. 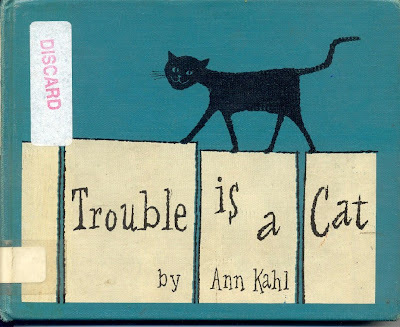 Written and illustrated by Ann Kahl, the story concerns a pesky neighborhood stray cat. (A familiar theme around our house). 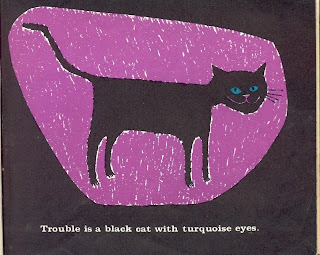 "Trouble is a black cat with turquoise eyes." 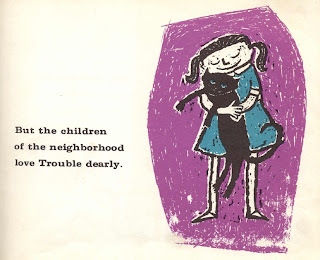 "The children of the neighborhood love Trouble dearly". ...and are always feeding Trouble, but their mothers wish they wouldn't. 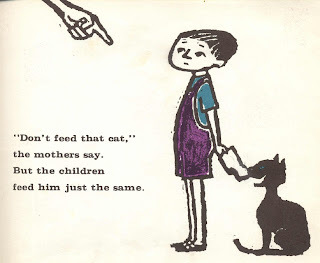 "Don't feed that cat," the mothers say. But the children feed him just the same. Trouble likes to sing at night and tease the dogs. He overturns trashcans and leaves mice and rats on the neighbor's doorsteps. One night he goes to sleep in a driveway and it snows all night, covering him up. Everyone thinks he died. But a man begins shoveling his driveway and scoops Trouble up on the shovel, flinging him into the air, which causes him to yowl loudly. 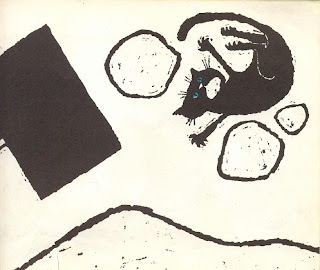 The children rush the cat, crying happily...the adults resign themselves to the situation, saying "after all, every neighborhood must have a little Trouble".